Amen is a word that came to English from Latin, which got it from Greek, which got it from Aramaic, which got it from Hebrew (technically, Aramaic may have had it anyway, before it became the standard language of the Jewish people a few centuries before the time of Christ). It is difficult to translate this word directly, which is often a reason that words are borrowed from other languages; if there is no direct way to translate a foreign word, then it seems sensible to simply adopt it. 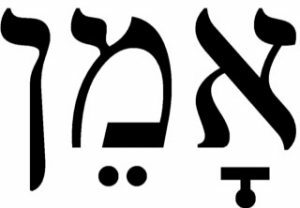 The specific Hebrew word ’amen appears to be derived from the related ’aman, which means ‘he confirmed’, ‘he supported’, or ‘he upheld’. This verb is also associated with the Hebrew word for truth (’emet), which carries the idea of certainty or dependability (i.e. that which is true is that which is certain or dependable). ’Amen itself is an interjection used to agree with, affirm, approve, or emphasise something else that has been said. Thus, when Jesus begins certain sayings by declaring, “Amen, amen, I say to you…”, various Bible translations often render the “amen, amen” differently. Because of the word’s association with the Hebrew terms for truth, the double amen is sometimes rendered “truly, truly” or “verily, verily”. Because of its association with the Hebrew terms for confirmation or dependability, one might also translate it “certainly, certainly” or “most assuredly”. When one says “Amen” in response to a prayer, it serves as an affirmation of agreement with the co ntent of the prayer (cf. 1 Cor 14:16)—in which case it is sometimes translated “So be it” (cf. CCC 2856)—or as an expression of faith that God will hear and act on the prayer. Immediately before the Lord’s Prayer at Holy Mass, we profess the ‘Great Amen’. By doing so, we affirm the words and actions of the Eucharistic Prayer. 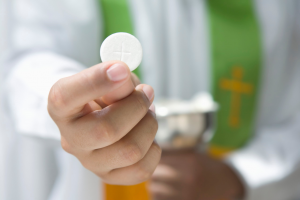 The minister of the Eucharist says, “the Body of Christ” and “the Blood of Christ”. When a person responds “Amen”, they are affirming this truth, that it is indeed the Body, Blood, Soul and Divinity of the Lord Jesus Christ.